Fortunately, things seemed to calm down last night in Ferguson, Missouri, where people have been protesting the fatal shooting of an unarmed black teenager Saturday night. A change in police tactics — which basically avoided the shows of overwhelming force police had exhibited on prior nights — seems to have eased tensions. The Ferguson situation raises serious questions about the “militarization” of police forces and their responses to protests. That issue, in turn, raises bigger questions about police accountability and whether officers have an unnecessarily confrontational “us vs. them” attitude that promotes clashes with a citizenry that is simply trying to exercise its constitutional right to assemble and protest. The weaponry police displayed in Ferguson — armored vehicles, army-style helmets and uniforms and tactical equipment, even sharpshooters — was astonishing. (Why the need for sharpshooters in these circumstances? Who were they targeting?) It’s legitimate to ask why municipal police need such equipment in the first place, and politicians from across the political spectrum are doing so. Separate and apart from the cost of purchasing and maintaining such equipment in times when many cities are strapped for cash, the reality is that once such equipment is acquired the impulse to deploy it will become irresistible. In Ferguson, it seems pretty clear that the use of the military equipment, tear gas, and rubber bullets unnecessarily fanned the flames. Police have a tough job, and the vast majority of Americans understand and support them as they perform it. The police role, however, is a limited one — to enforce laws and apprehend criminals. When a protest occurs, police of course may properly arrest anyone who throws a brick through a window or who assaults a police officer. But police are public servants, and when there is a question about whether police have overstepped their authority by engaging in improper use of lethal force, as in this case, citizens have every right to question, and protest, and take photographs of police as they perform their jobs. When police are arresting journalists in a McDonald’s, tear-gassing news crews, and firing rubber bullets randomly to try to disperse crowds, as happened in Ferguson, it’s fair to conclude that police have overstepped their role. We are not sheep to be herded, and police officials need to understand that. Law enforcement authorities must respect the fact that Americans have the right to protest and question police activities. 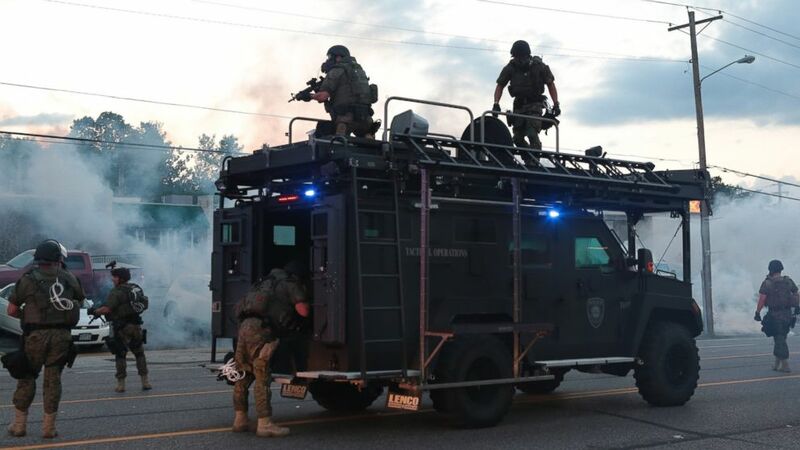 I’m hoping that the Ferguson situation causes municipal authorities across the country to reassess their need for military equipment and their tactics when protests occur. This entry was posted in America, crime and tagged America, crime, Ferguson, Militarizing Police, Missouri, Police, Protests by webnerbob. Bookmark the permalink. pls recalibrate.dc is too good at war.lose the gun or get blanched by people tougher than darkzoid43.